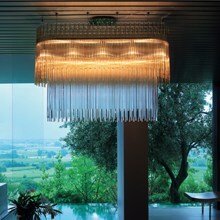 Part of a collection of diffusion lamps composed of hand-crafted transparent glass tubes. Each tube�s flexibility combined with different light sources allow an endless range of applications.Glass tones are crystal and topaz. Metal parts are chrome.